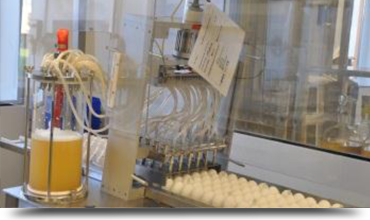 The production of SPF Eggs is based on the guidelines of the European Pharmacopoeia EP7.0.5.2.2. and the United States Department of Agriculture Veterinary Services Memorandum 800.65. To achieve and maintain SPF Status under these requirements, two generations prior to the producing generation must be free of the listed agents. The producing generation must maintain the status throughout lay and is monitored through extensive testing performed by certified veterinary laboratories. VALO BioMedia is the only company in the industry with its own pedigree breeding lines grown under SPF conditions. VALO BioMedia selects the best performing combination of four pure lines to create a hybrid cross that produces SPF eggs of the highest quality. The continuous selection process on the pedigree level also results in annual genetic progress and the resulting improvements in product quality. In regular SPF breeding programs, without pedigree lines, changes in the characteristics of the end product through genetic selection, if at all possible, will take much longer. As the VALO BioMedia pure lines already maintain SPF status, the product development cycle at VALO BioMedia is shortened to two years. 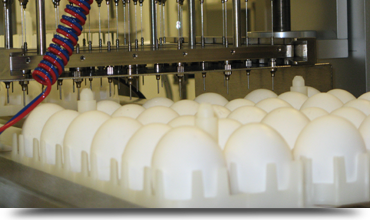 Hence VALO BioMedia is capable of more quickly improving the characteristics of the eggs as well as offering a differentiated product range suited to the various uses of Vaccine Eggs. The breeding index gives an overview of the genetic traits used in the selection of SPF and Clean Egg pedigree lines. Fertility is influenced by fecundity of the males and females, disposition of the birds and activity of the males, all of which are genetically affected traits, as well as the production system and flock age. The egg shell quality is a factor of the birds’ ability to metabolize calcium and the way that calcium is constructed in the shell. Also the egg weight curve (egg size profile) has an effect. These factors are largely influenced by genetics. Other factors are feed and the age of a flock. The pre-incubation selection program measures the speed of cell replication in the fertile egg which affects embryo development and egg weight loss which both influence the yield of allantoic fluid. The quantity of allantoic fluid is largely predetermined by the genetics of a bird. Crosses are optimized to result in higher volumes of allantoic fluid. The embryo viability is a key factor affecting the average yield in virus production. A higher quantity of vaccine virus can be harvested if an embryo survives the infection of the seed virus for a longer period of time. Embryo livability can be influenced by genetic selection. We are dedicated to delivering this value to you and to improve our products’ performance in your vaccine production every day. 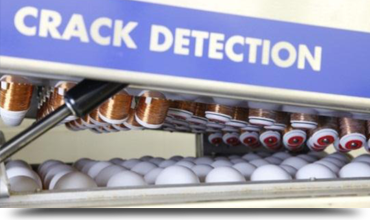 Our SPF Eggs are produced in state-of-the-art facilities under the constant supervision of the quality assurance team. VALO BioMedia has the highest biosecurity and hygiene standards and consistently exceeds the guidelines of the European Pharmacopoeia through permanent quality controls. To preserve a disease-free status, VALO BioMedia’s production sites have been located in areas with low chicken population densities. The housing conditions of the SPF flocks are managed according to HACCP (Hazard Analysis and Critical Control Points) and monitored at all times. During the entire rearing and production period, the birds only receive heat-treated feed that is tested for contaminants, as well as pure well or public water which is also constantly monitored. VALO BioMedia SPF flocks are housed in buildings with three-stage air filtration systems that meet HEPA and ULPA standards. To ensure proper biosecurity, all buildings are continuously maintained under positive air pressure. Of course, our farms are equipped to meet or exceed all current animal welfare standards and laws.